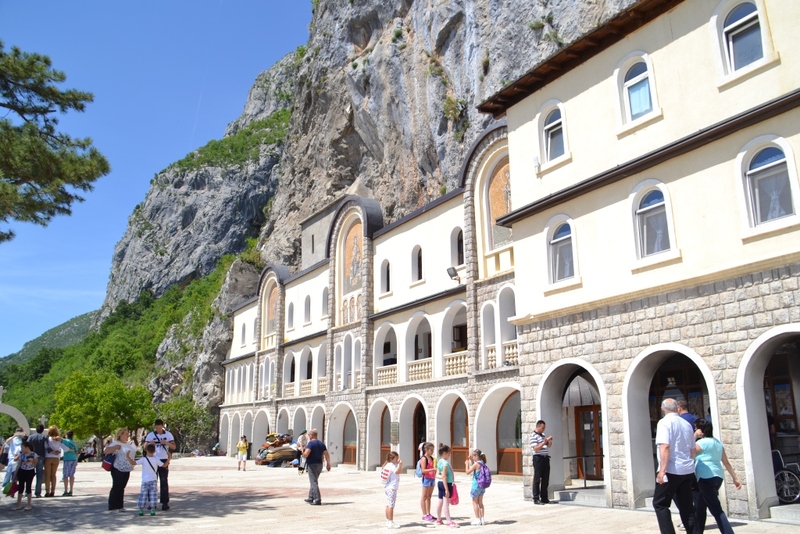 Before we knew what exactly to see in Montenegro, we had been already sure that we want to visit Ostrog Monastery that is dedicated to St Basil of Ostrog (Sveti Vasilije Ostroški). 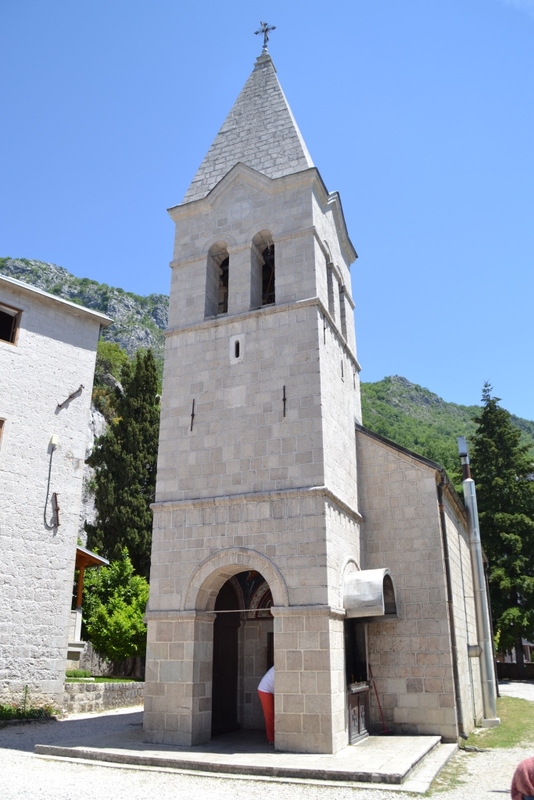 Apart from its picturesque location, the monastery is as well one of the most spiritual centers for all Orthodox Christians in Montenegro. 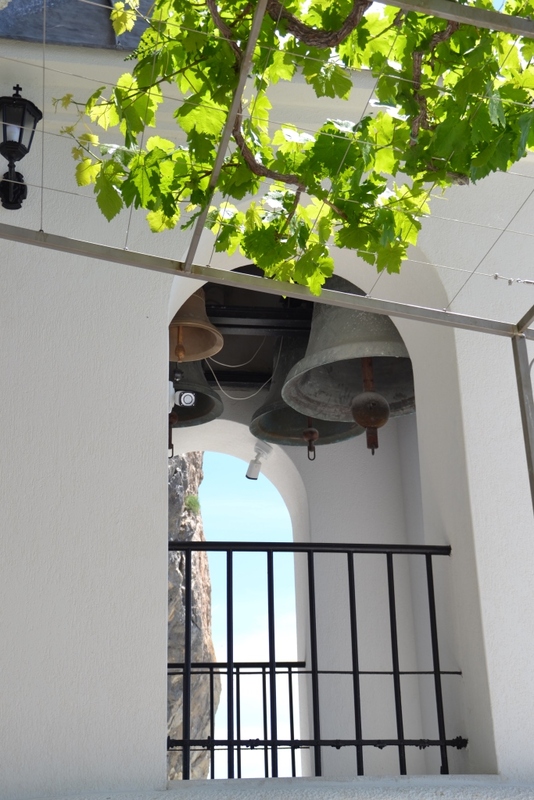 The Monastery was founded by the Metropolitan Bishop of Herzegovina Vasilije in 17th century. The Bishop with the group of 30 monks from Tvrdos Monastery in Bosnia had to flee from Turks and the Ottoman Empire. He decided to build a monastery in a place difficult to reach for Turks. 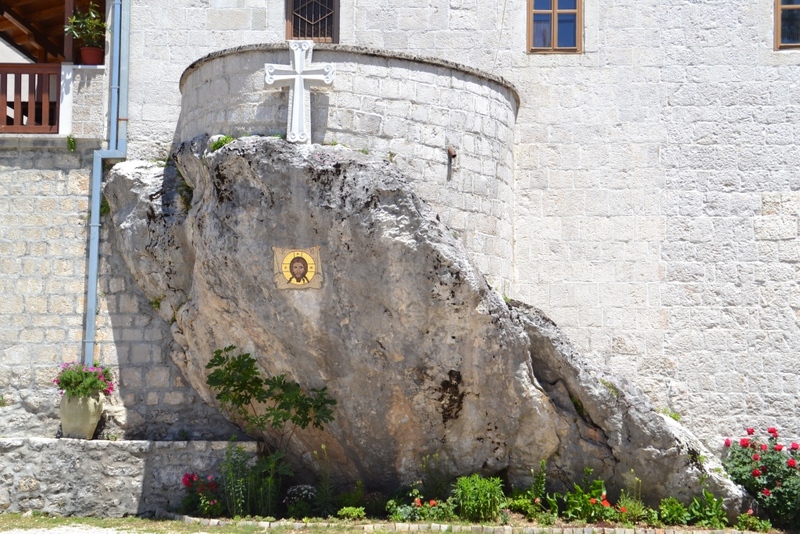 And indeed, carved in a vertical mountain cliff, Ostrog Monastery looks inaccessible. Ostrog Monastery comprises two monastic complexes: the lower monastery with the Church of Holy Trinity and the upper monastery. 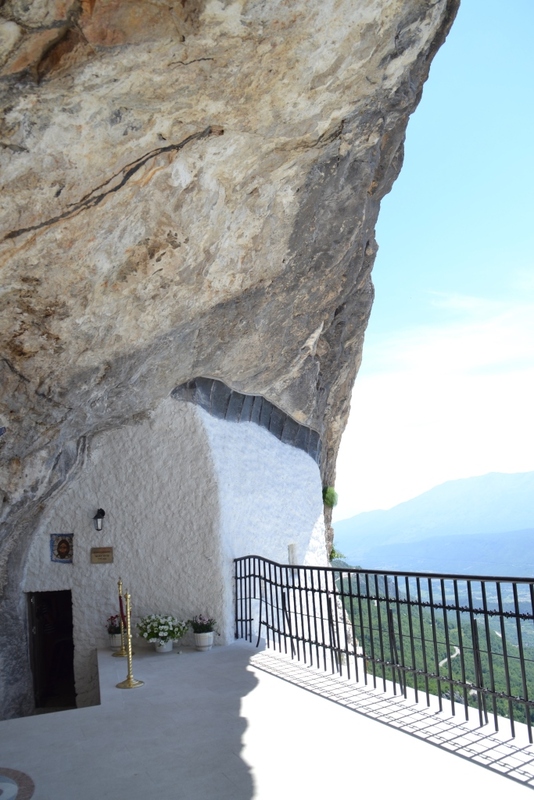 In the upper monastery there are two cave churches, the Holy Cross Church with beautiful rock-painted frescoes and the Church of the Presentation, where the Holy Relicts of St Basil are kept. 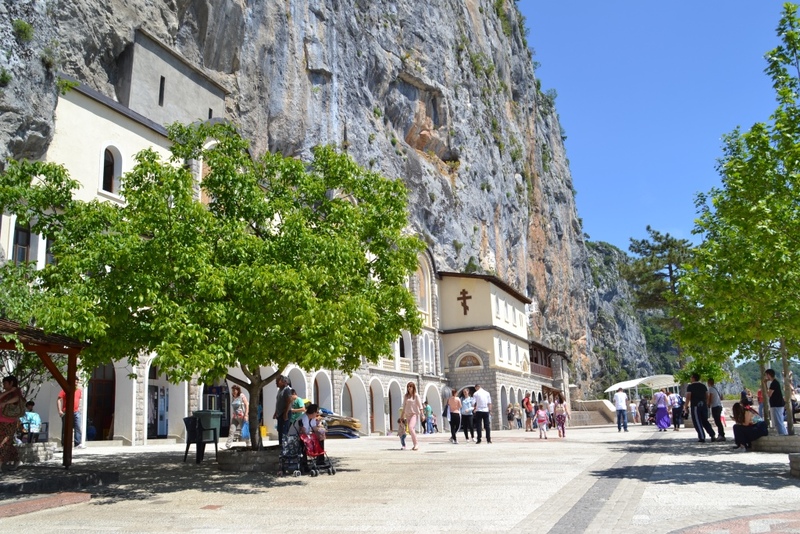 As we already mentioned, Ostrog Monastery is one of the most popular pilgrimage place in Montenegro and as we were going there during the Hole Trinity Day, many people were visiting the Monastery as well. When security officers noticed that we are coming with a small baby, they immediately let us drive as close as possible to the Monastery. (We are very grateful for it, later on during our trip through Poland we will not have privileges like this 🙁 ). To Ostrog we arrived when the Liturgy in the lower monastery was finishing. Monks and nuns were leaving the church while we were still in front of our car. Passing nuns and monks were smiling to Zosia and one of the nuns approached us and kissed Zosia’s forehead. It was so unbelievable beautiful and somehow natural. We waited and went inside the lower church. In Serbian Orthodox church there is a tradition to cover the church floor in Holy Trinity Day with field grass. Later on people are making wreaths from it. We had no idea about this tradition, but a local woman came to us and explained it. Three wreaths are representing the Holy Trinity and are taken home and placed close to the icons. (More about Serbian Orthodox traditions you find on: http://www.umiacs.umd.edu/users/lpv/YU/HTML/food_religious.html). We made wreaths as well and put them in the front of our car. Since then they became our travel companions and reminders of the Holy Trinity Day in Ostrog Monastery. 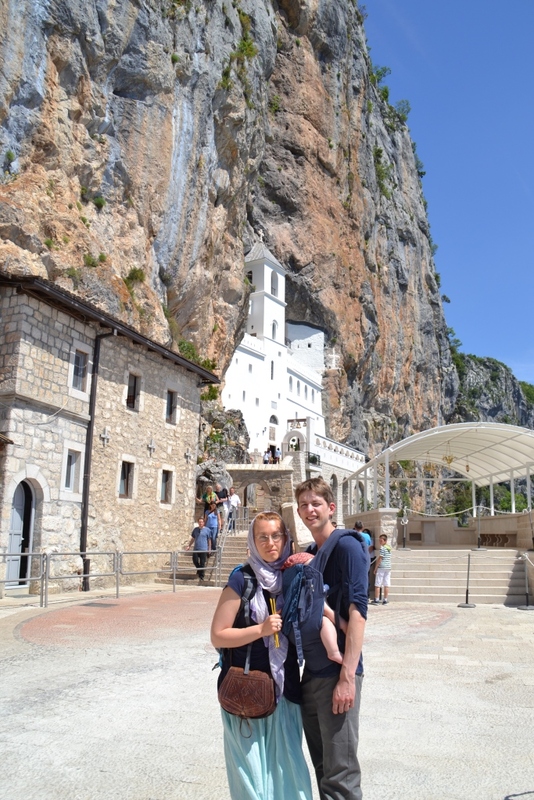 The people we met in Ostrog Monastery were unbelievable friendly. When we were in the upper monastery, many of them were stopping, smiling to our daughter, saying “mala beba” or “mala bebica” (=little baby), touching her hands and sometimes even kissing her small bare feet. Zosia found it very amusing 🙂 It was really nice. Being used to the German rather distanced way of meeting people / families / children, it was really refreshing to get so much attention, happiness and warmth from people you don’t know. And it was not just at Ostrog Monastery where we felt welcome and met warm people, it was around the whole Balkans.